TBILISI, DFWatch–The regional court in Russia’s Krasnodar region upheld the decision made by the lower court to imprison a popular 67-year-old Circassian civic activist, while his supporters were barred from attending the trial on Monday. The trial lasted only 27 minutes and upheld a 10 thousand rubles (USD 170) penalty against Ruslan Gvashev. Gvashev did not appear in court for health reasons. A group of Circassians and Kabardins heading from Nalchik to Krasnodar by minibus were stopped in the morning by Russian police and barred from entering the city, citing a minor offense by the driver. Nonetheless, a handful of Gvashev supporters managed to gather in front of Krasnodar court to challenge the decision. 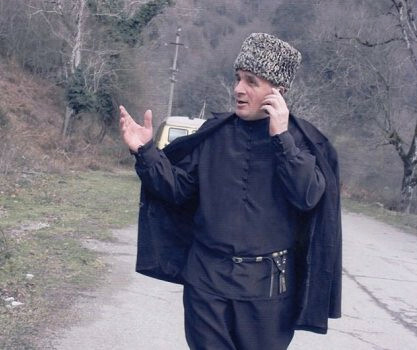 Ruslan Gvashev was fined for ‘extremism’ after he organized a mass prayer on May 21, a day of remembrance for Circassians and Abkhaz who perished during a period in 19th Century when Russia conquered north western Caucasus and brutally quelled fierce local resistance. Hundreds of thousands of Caucasian highlanders were either massacred or driven out of their homeland. Many of them, mostly Sunni Muslims, left the Caucasus and resettled to different parts of the Ottoman Empire. Every year, Circassians gather in the small village Golovinka, near Sochi, for a public prayer ceremony next to a 200-year-old saddle tree they regard as sacred. Russian authorities, fearing separatist sentiments in the Caucasus, have usually grudgingly accepted this event, but this year Russian police broke up the gathering, declaring it illegal and extremist. Gvashev has a great deal of informal authority among Circassians and other related Caucasian ethnicities, including Abkhaz, and his detention caused widespread indignation. Protest rallies were held in several cities across western Caucasus, including Sochi, Sokhumi and other places with a significant Circassian and Abkhaz population. Circassians (native name Adyghe) live in the north Caucasus in the Russian Federation’s autonomous regions Karachaevo-Cherkessia and Kabardino-Balkaria, and Republic of Adygea. They have various sub-ethnic groups which feel themselves bound by shared history and culture. In a broader sense, the term includes also Abkhaz people since they are originally related to Circassians. Hence, during the War in Abkhazia in 1992-93 many Circassians took an active part in hostilities against Georgia. Gvashev was one of those who fought in that war. He had the rank of colonel and also played a key role in mobilizing volunteers from North Caucasus. However, during last decade, Georgia made efforts to normalize relations with Circassians. Particularly notable is the fact that Georgia is the sole country in the world which has officially recognized Tsarist Russia’s policies in 19th century against western Caucasus’s indigenous peoples as a genocide. On May 20, 2011 the parliament of Georgia declared that the mass annihilation of Circassian during the Russian-Caucasian war and thereafter constituted a genocide as defined in the Hague Convention of 1907 and the UN Convention of 1948.